As an example, 2005 Butterdragon for $35 a bottle when purchasing 12 bottles from our 2005 – 2007 vintages. And that’s before Repeat Customers apply their discount! Greetings Friends and Happy Autumn. We’re a little late this year with our release letter. It’s been a busy few months of travel, a back-to-school move, and we’ve already harvested. Spring was early this year and all season long the vines were several weeks ahead of the usual schedule. Fortunately the weather remained very mild and dry allowing a nice, long, even growing season with temperatures in the perfect mid 80s degree range for weeks. When we harvested Baconbrook in mid September the fruit was the best we had ever grown. But enough about the present. I’m writing to you about the past: the 2010 vintage and our 2010 Baconbrook Cabernet Sauvignon. The 2010 growing season gave our brilliant vineyard management teams the opportunity to really earn the (rather significant) money we pay them to keep our vineyards in world class shape. An unusually cool, foggy summer and rampant shoot and lateral growth required many passes to control mildew pressures and keep the canopy open and air circulating. 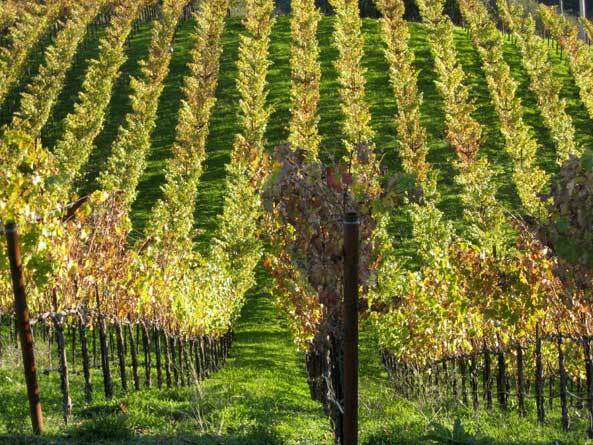 However, opening the canopy, while helping with the predominantly cool temperatures, would prove to be a bit of a challenge when Napa experienced 3 day heat spikes on August 24 and September 28. It was sort of like going outside in the hot sun without your cap on. The resultant dehydration reduced tonnage in what would otherwise have been a pretty big harvest. This unusual weather produced an unusual result for Napa: The grapes’ seeds and flavors began to mature while the sugars accumulated more slowly. It usually occurs the other way, sugars first, then the seeds flavors. As a result, ripeness was achieved at lower Brix which should be good news to some of you more traditionalists. Shipping should begin in late October but we will hold your order until cool temperatures allow safe shipping. Hopefully you haven’t suffered too much anxiety worrying if our Fall mailer would ever arrive and hopefully your bank account has recovered from all the wines you bought in September. Thanks for making our wines part of your family’s table.